For their outstanding teamwork in realizing a solution for safe and reliable isotope production for hospitals in Canada, interdisciplinary research team CycloMed99 will be receiving a prestigious national award at a ceremony in Ottawa today. The Honourable David Johnston, Governor General of Canada, will present the NSERC Brockhouse Canada Prize for Interdisciplinary Research in Science and Engineering to the team in recognition of their seamless teamwork and successes. The recipients of the Brockhouse Canada Prize include Drs. Paul Schaffer (TRIUMF), François Bénard (The University of British Columbia), Anna Celler (The University of British Columbia), Michael Kovacs (Western University), Thomas J. Ruth (TRIUMF), and John Valliant (McMaster University). Full affiliations listed below. Drawing from expertise in physics, chemistry, and nuclear medicine, the team set out five years ago to develop a reliable, alternative means of production for a key medical isotope in order to eliminate the threat of a supply shortage – a catastrophic healthcare crisis for patients around the world. Technetium-99m (Tc-99m) is the world standard for medical imaging to diagnose cancer and heart disease. Every day, 5,000 medical procedures in Canada and 70,000 daily worldwide depend on this isotope. 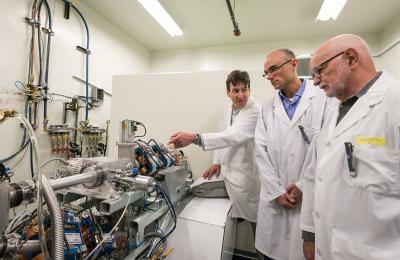 With funding support from NSERC, CIHR and Natural Resources Canada, the team developed technology that uses medical cyclotrons already installed and operational in major hospitals across Canada to produce enough Tc-99m on a daily basis. This innovation is safer and more environmentally friendly than current technology because it eliminates the need for highly enriched uranium, also avoiding the generation of highly radioactive waste. Canada’s healthcare system would save money by producing isotopes locally under a full-cost recovery model. The project resulted in over a dozen scientific publications, several provisional patents and a training opportunity for more than 175 individuals. Now, the research team is focused on working with the world’s major cyclotron manufacturers to add factory-supported Tc-99m production capability to their existing product lines so the technology will become standard in future machines.CycloMed99 is also working with a Canadian start-up company to license, transfer and sell this technology around the world. This will allow hospitals and companies with cyclotrons to retrofit their existing infrastructure with a Made in Canada solution to produce this valuable material. Dr. John Valliant, a chemist by training and Scientific Director and CEO of the Centre for Probe Development and Commercialization; and Professor at McMaster University. –Taken from a TRIUMF press release, with content from NSERC.